Coast Communications and 20 of its fellow agency partners in the PRGN network made a $7,000 payment to the Niall Mellon Township Trust, non-profit, building homes for impoverished families in Cape Town, Witsand. As part of that donation, a group of PRGN volunteers participated in the building of the PRGN House on April 18. At the end of the day, the keys were handed over to an overjoyed family. Coast Communications volunteers and its PRGN colleagues spent the day working on site. 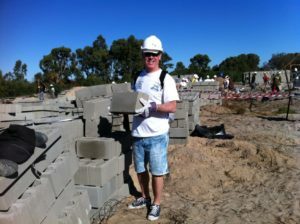 It was joyful work with hard hats on under the African sun. PRGN joined the Niall Mellon Township Fund based in Dublin. Since 2003 Mellon has built more than 20,000 homes that have moved local families from shacks to three-room homes. Coast Communications was founded in 2001 and has its own operations in Stockholm and Copenhagen. The agency focus on Public Affairs and Investor Relations and was voted “Best Agency” in Sweden by its clients in the country’s leading trade magazine, Resume, year 2009 and nominated for the Columbi Egg award for its CSR work later same year. Since 2006 Coast is a proud member of PRGN. Public Relations Global Network, Connected Thinking. Globally.